During his lifetime, Bernstein’s theatrical successes worked against his reputation as a composer of serious art music. But the array of works to be heard here this summer seems designed to prod these boundaries and ask whether we are, finally, ready to listen through Bernstein’s output as the product of a single masterfully assimilative mind, a composer who reimagined both concert music and stage music in each other’s image. But of course in December 1944, when “On the Town” premiered, all those tensions lay in the unknowable future. This show — with book and lyrics by Betty Comden and Adolph Green — seemed propelled by something more simple: the sheer blind confidence and audacity of talented youth. None of the core collaborators was over 30, and none had worked on Broadway before. Bernstein had met the choreographer Jerome Robbins only the previous year and the two had immediately connected. Both had been precocious children of immigrant Jewish families with business-minded fathers who kept skeptical tabs on their early artistic careers. By 1943, Robbins had already devised the scenario for the ballet “Fancy Free,” in which three young sailors spend 24 hours in New York City. Bernstein had already scribbled a bit of music on a napkin in the Russian Tea Room. The rest is theater history. These days “On the Town” is heard about more than it is heard, as if the entire musical were some sort of elaborate pretext for giving posterity the song “New York, New York.” But the work as a whole stands up, with its sharply drawn wit, its scenic velocity, and its brilliantly hybrid score infused with that youthful exuberance from first bar to last. 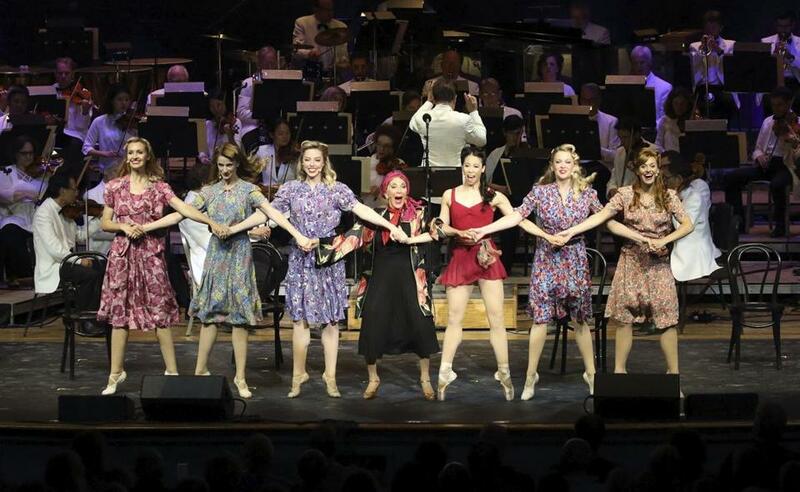 All of that came through vividly in Saturday’s semi-staged performance — conducted by Keith Lockhart, directed and choreographed by Kathleen Marshall, with musical direction from David Chase. If “New York, New York,” which appears early on, joyfully telegraphed the sailor’s giddy sense of adventure, “Some Other Time,” which is sung once their 24 hours have all but vanished, captured with glowing wistfulness just how many aspects of everyday life in wartime were deferred into an unknown future. Saturday’s excellent cast was full of Broadway veterans. The trio of sailors was played by Brandon Victor Dixon as Gabey, the misty-eyed romantic who pines for the beauty pageant winner he sees on a subway poster; Andy Karl as Ozzie, who aims lower yet is pleasantly surprised; and Christian Dante White as Chip, who meets a taxi driver more interested in her house than his. Indeed, especially notable for its time was not only the show’s mixed-race casting but also its strong female characters. The sailors’ dates are each bolder and more liberated than the last, including Claire De Loone (here, Laura Osnes) the mischievously studious anthropologist of men; Hildy Esterhazy (Megan Lawrence), the take-no-prisoners cabbie; and Ivy Smith (Georgina Pazcoguin), the beautiful yet elusive singer who longs for a life of art but makes her living as a cooch dancer on Coney Island. Andrea Martin played a number of hilarious smaller roles, including the tippling voice teacher Madame Maude P. Dilly. And Marc Kudisch was Claire’s fiance, Pitkin W. Bridgework, ever-indulgent of her dalliances until he isn’t. Lockhart has been leading the Boston Pops in plenty of Bernstein already this year, and he drew vibrant and assured playing from the orchestra, full of rhythmic elan. All told, it was a highly auspicious start to the Bernstein summer at Tanglewood. 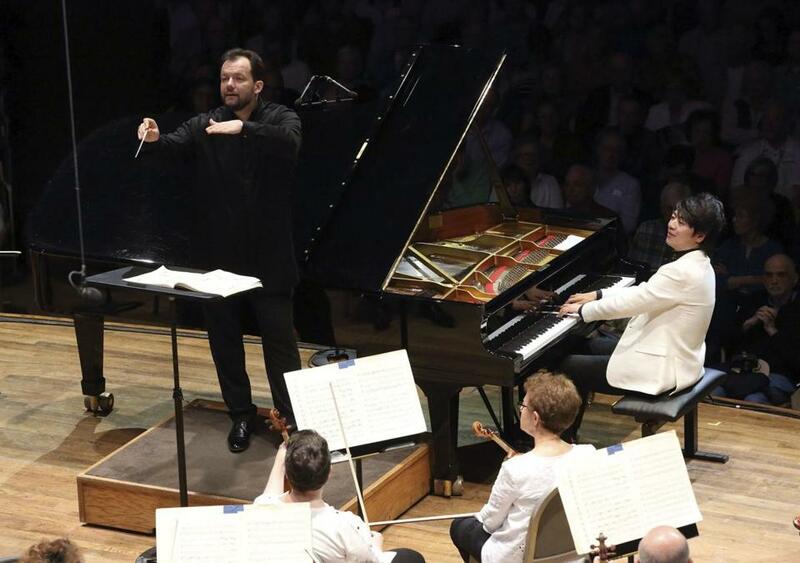 Andris Nelsons led pianist Lang Lang and the BSO at Tanglewood Friday. This was not, however, the start of the BSO’s Tanglewood summer. Technically that came the previous night as music director Andris Nelsons led the orchestra in Mozart’s “Magic Flute” Overture and Tchaikovsky’s Fifth Symphony, the latter receiving a lean, focused, dramatically powerful performance. Between the two works came a visit from the superstar pianist Lang Lang, making a somewhat low key return to the soloist’s spotlight after a lengthy hiatus due to a left hand injury. Originally slated to perform Tchaikovsky’s mammoth Piano Concerto No. 1, Lang ultimately scaled back to the classical refinements of Mozart’s Piano Concerto No. 24, a work whose challenges, for the battle-tested virtuoso, are less athletic than musical. Happily, by way of a report on his recovery, the pianist appeared at ease and in full command of the technique required for this first outing. His playing trafficked — to an almost daredevil degree — in extremes of pianissimo. For this listener, the micro-inflections in phrasing and dynamics often worked against the music’s broader expressive arc, but the performance overall drew hearty approval from the Shed audience. I’ve never seen a performer sign an autograph while bowing from the Shed stage, but Lang did it on Friday night. Then he sat down for an encore — Chopin’s Nocturne No. 20 in C sharp minor — floated once more in wisps and whispers. Andris Nelsons and Keith Lockhart, conductors. At Tanglewood Friday and Saturday nights.